Air-conditioning. The frozen piña colada. Intentional brain freeze. All respectable ways to cool down in the summer. A quick jaunt to Patagonia for some snow polo. 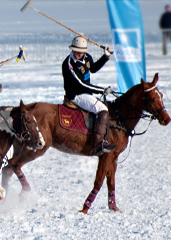 Presenting Snow Polo at Pire-Hue Lodge, a midsummer cooldown junket to Argentina with the express purpose of sharpening your polo game under the tutelage of an Argentine polo maestro, taking reservations now. Think of this as exactly the opposite of a slow, boiling Tuesday morning city commute. You’ll retrieve your most sporting parka from storage, hop a puddle jumper into Bariloche, Argentina, rendezvous with your instructor (most likely named Alejandro) and hit the lodge. Matches are three-on-three instead of the usual four-on-four and the ball is lighter, larger and (for obvious reasons) red instead of white. After unleashing your grace on the field, you’ll head back for an après-polo meal of wild boar and think about how you’ll improve upon your snow-handling skills tomorrow. Since you’re still familiarizing yourself with the loaner pony.